The other day, I was thinking back to when I first started my blog and was kind of new to everything and was just reviewing everything on my bookshelf, slowly building up Pretty Little Memoirs. And not because I wanted it to be popular or even noticed by a whole bunch of people, but because I cared about books and wanted everyone else to know just how incredible the book I was reading was. A few years on and things are quite different here! I get requests to do so many fun things on my blog with AMAZING authors, get to go on Blog Tours, book blitzes and blasts, get to read ARC's (which is kind of like the best thing ever), hold giveaways and a whole lot of stuff that seems pretty important and huge for a girl who started this with just a love for books. I still get just as excited about the new reads coming out, about shopping for books, talking to my favourite authors on Twitter, etc. The "book-buzz" as I like to call it, hasn't faded. Being surrounded by books hasn't made me feel like "UH, I really hate them now" or "I can't be bothered to read anything anymore" or anything like that. Books are still my Number One and I could literally be surrounded by them forever. But, here is a list of the things that I think might just be the best things about being a Book Blogger (or blogger in general), to maybe entice new book-lovers to start blogs, get involved, or just reignite your enthusiasm for reading! 1. Creative People If you're the creative type of person, maybe you like crafts and making things yourself, or things like HTML code making, etc, then the whole "making your blog the best it can be" part is definitely one of my favourites. Some bloggers will buy a Premium theme from someone who designs as a job or hobby, so they have pretty much a theme that looks great from the offset, or some prefer to HTML it themselves, or just try their hand at designing using the skills they already have (after all, it's not the design of your blog, it's the things you write that people will be drawn to the most at the end). Pretty Little Memoirs has been through a TON of makeovers and HTML adjusts (all my own, some successful and not so much...) and I've been trying to learn code and spent hours picking themes for banners and finding images...and that's fun, if it's your thing. And you'll meet tons of Bloggers alike if you're the creative type, or maybe there's another hobby that you're into, Book Bloggers don't always talk about books (even though it's a top subject, haha). 2. Finding your voice Maybe you're already blessed with a natural talent for making people feel like they know you when they read what you're saying online, through your reviews and posts, but for others, it can take a while to get to a point where it feels like your actually writing for an audience of your blogger friends and readers, instead of just writing bland words on a web page. I've always wanted to be an Author, so finding my voice was an important part of writing my blog. I've been trying to find what I sound like through typed words, instead of just, like I said before, words on a page. And I *really* hope it comes across like me and not just some font on a blog. 3. Advanced readers I read quite fast, some days I read A LOT and some days I just read a few pages, but depending on how many ARC's I have stacked up, I move through them pretty quickly. I don't read like skipping-through-the-pages-really-fast-and-not-really-reading, because what would be the point of that? I've always been a believer that every book deserves a chance to have it's good points stated, because no one wants to see a 100% negative review, because there is always something good about a book, even if it was just one character or one chapter. Getting ARC's always feels like a huge privilege to me and I am over-the-moon grateful whenever I get the chance to read a book before it's out in stores, and even more when it's an uncorrected proof and one of my favourite authors or a debut. That makes the book-lover within me giddy. 4. Bookish Events I think BEA has always been a dream of mine to attend, to get lost in a world of books for a week or so...but, being UK-bound and all, it's pretty hard to get across a country being a teenager and in a completely different time zone. But it's still a goal of mine! There are tons of events out there for book lovers, not just in certain countries (like signings and conventions) so it's like a little community and everyone is just so welcoming. And you're always going to find someone with a liking for what you do, too. That's the beauty of books! 5. Experience If you want to be an author, blogging is a great way to start. That's not the reason I'm a book blogger, but it's still there. I've written small stories, poetry, pages of ideas...since I was really young, so writing and getting published has always been a dream, and blogging definitely get's my writing skills improving all the time, especially if I'm writing in the first person POV. If you're just starting a book blog, it's going to seem pretty scary not knowing who or if anyone is reading your blog, but that's how every blogger starts out. No one get's readers straight away and it can take a while to see recognition. But that's all part of the social blogging experience and it's been a massive help for me to reach out to blogger friends and authors. If I had never blogged, I would never have achieved half the things I have. Let me know in the comments or on your blog, and leave the link! I'd love to see your posts on why you love blogging. Great article, Becca. I think posts like this is what makes me want to visit a blog more often. I like reading stuff other than book reviews and such. 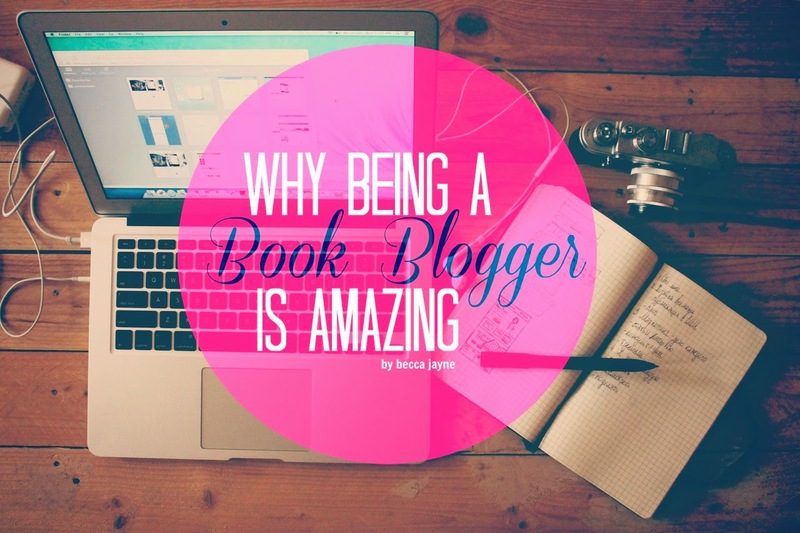 I've been blogging for almost 3 years now, but I can't say that I've already found my place in the book blogging community. For the most part, I'm just happy to be here. And I think that's one of the important things we need to remember.